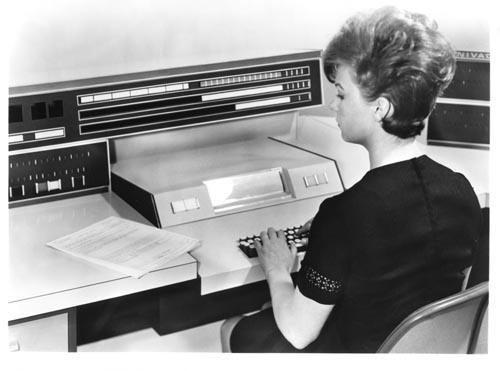 Black and white image of a woman sitting in front of the UNIVAC 494 Control Console. Verso: attached paper "Control console of the new UNIVAC 494, largest and most powerful computer of a new series of modular real-time data processing systems announced by Sperry Rand Corporation's UNIVAC Division. The UNIVAC 494 is a super-speed general purpose computer that is six to ten times faster than the present UNIVAC 490 Real-Time Computer. Known as the UNIVAC 490 Modular Real-Time Systems, the series is comprised of the low-cost medium scale UNIVAC 491; the intermediate UNIVAC 492; and the large-scale 494. The compatible series is availaable in a wide range of systems configurations that allow users to increase power, speed and storage capacity to meet real-time and batch processing needs. ### For Further Information: Fred K. Fukuchi Sperry Rand Corporation UNIVAC Division Sperry Rand Building New York, N.Y. 10019 (212) 956-2140"